We love Leapfrog and would love to try Leap TV! Would love to give these to the Grandsons they are just now getting into Leapfrog. Great giveaway! My son really enjoys LeapFrog products and I like that he is learning while he has fun. Can’t wait to introduce my kids to leapfrog! I would love to win this for my 3 kids. We LOVE Leap Frog and how the kids get to play and learn! we are always in need of *hopefully* educational things for our kids to do on long trip to visit family. The LeapFrog products would be swell. We are huge fans of Leapfrog and I love how they are fun yet educational. MN winters have us cooped up and going crazy! I would love to get this for my little ones to wiggle some energy out! I LOVE Leapfrog! My almost 3 year old would love this for his birthday this year in May!!! My triplet grandsons would love these prizes. Oh, my 4 year old would be sooo happy! Awesome giveaway! My daughter loves LeapFrog and I love that it’s not only fun but educational too. My daughter has been asking for a leap band, and I know she and her brother would love the leap TV. thanks for this great chance such a blessing to be entered best of luck to everyone….great blog!!!! I know my kiddos would love to win. I love how it would help with their many different stages of learning the 3 of my kids are. Wow! What an amazing assortment of Leapfrog products! I would love these for my kiddos – how fun! This is an entirely fantastic prize, thanks for the chance. The weather is colder and even when it is warm these are great to occupy the kids during dr visits and grocery trips. I an looking forward to checking out that Leap Band for my boys! Oh what a great educational prize package! Would be so helpful in preparing him for Kindergarten next year! I would love to win t his for my niece and nephew.. This would be awesome, I wouldn’t have to share my ipad! Great giveaway, Monica! My kids would be all over this! OMG this would be AWESOME to win, my son would go nuts!!!!! What an awesome giveaway – fingers crossed!! What fantastic products that my grandsons would love to have! My 3 1/2 and 5 year old would love these. I love that these toys are not just fun but educational! I would love to win this! Such a great giveaway! I would love this for my son Cooper. This is a great giveaway! Tganks my grandson will love it. My kids would absolutely love this all!! Leapfrog is a trusted brand worthy of respect. My granddaughter loves Leapfrog products. I hope I win this for her. My boys would absolutely love this. They have been looking at the LeapFrog TV since they saw it during the holidays. My girls would totally love this!!! Thanks for the chance!!! This would be a great gift for our nephew! I’m sure he would love to try Leap TV. This is such a great giveaway!! My son would absolutely love this…such a blessing it would be to win! This is a terrific product — would love to give it to my granddaughter. She would really enjoy it. my daughter LOVED her leappad but we lost it .. noooo I gotta gain it back. hopefully by winning another one! crossing fingers! My grandsons would be thrilled with this. Love LeapFrog!! My little one moving along to the next stage and this would be great for her ; a great learning and fun tool. My little girl would love love love this. Her older brother has the first LeapPad and she gets to use it once in a while. She would love her own. My kiddos love leapfrog! Thank you for the chance! They would have a blast with these products! These Leap Frog Products would be a great learning gift for my daughters! This is such a great giveaway. Not only is it a fun toy/electronic. It is an educational toy/electronic that can teach and make learning fun. What a fantastic giveaway! I’d love to win it for my nephew. I would love this for my 3 year old daughter. Thanks for the chance! Leap Frog Products are such great Learning tools. Would love to have Leap Frog TV for my little one. Awesome giveaway! We love Leapfrog. My daughter has the LeapReader books. The Leapfrog baby toys have been a hit in our house. My son and daughter would love this package! What an amazing giveaway! We love LeapFrog products!! What a fantastic giveaway! TY so much for the change to win this incredible prize package! Thanks for a great Giveaway! If I win it will be my youngest grandsons birthday present. Love Leapfrog!! My grandsons would get so much from this package. LeapFrog has always been a go-to in my home for teaching my little ones. This prize pack is awesome. Thanks for the chance! My kids loved Leapfrog books about 15 years ago when they came out. The girls are college age now but really loved those dinosaur and science books. If I win, I will hang on to these until the Xmas adopt a family drive as all my friends with kids are doing well financially and I’d like a kid who would otherwise not have a chance to enjoy this. LeapFrog toys are awesome. My son loves everything LeapFrog that he’s received! Leap frog has great toys for the children. This would be great for the little boys in my life. This would rock Jack’s little world – and mine, hanging out inside in this cold weather is driving me batty! We need new games. this is an amazing giveaway! I love seeing children learn while having fun! Thanks for the great giveaway. My daughter loves Leapfrog products and she would love this. as a preschool educator I have always thought highly of LeapFrog. i have not seen LeapFrog used but I think my neighbor’s son would love it. What a great teaching and learning tool. My daughter is 5 & would love this! I really like LeapFrog. I think it is the best educational game for kids. I’ve been trying to get one for my godson because he needs more educational games. What a great giveaway! My kids would love this. What a great group of products. I would love to share this with my nephew. I’d love to try these for my 4 year old! I wonder if it would help him with learning to read. He knows his letters and sounds, but doesn’t understand the concept of sounding things out, and can’t grasp rhyming. We trust leapfrog as a wonderful brand that offers so many educational opportunities while allowing kids to still have fun! These products look and sound like they will be amazing! This would be perfect for my young niece! She’d love it! I would love to win this for my grandsons and thanks so much for this awesome giveaway! My kiddos would love this! Thanks for the chance!! Leap Frog products are so educational and fun for the children. I now have a grandson that is ready for Leapfrog. Thank you for this wonderful chance. My children would love this! thanks so much. We have many Leap frog toys. My daughter got a LeapFrog game this Christmas but we don’t have a system to use it with. We’d love to win this prize and put the gift to good use! Thanks!! My son would love this! Huge leapfrog anything fan! My kids would love this, thank you for the lovely contest. This LeapFrog Mega bundle is perfect for my kids to promote healthy learning, very educational brand. My kids would love this! They are huge fans of LeapFrog! This would be great for my DIL’s nieces. My nephew has a LeapPad 2 and loves it! This would be amazing for my Godson! We love Leapfrog in our house!! My son’s Leappad Ultra just stopped working. This is a timely giveaway! We love Leap Frog in our house! We’re huge fans and they have helped our kids learn to read! The Leap Frog Tv looks like its fun and educational and would be a great learning tool! The Leap TV looks pretty neat. When at TRU my son spotted it but it was not set up to play. It just kept repeating a video on it. Thanks for the giveaway. I am so interested in Leap TV, it says that it adjusts to your kid’s age. I love Leapfrog all of the learning fun that they have. My grandkids would be excited to win this. Great contest I would win this for my kids! Dying to try the Leap Tv with my kids! great giveaway. would love for my great nieces that are 6, 4 and 1. Great giveaway! My son would really love this LeapFrog product. I am sure we would love the Leapfrog TV. I love all thier products. we love Leap frog products. I would LOVE to win this prize pack for my daughter! We’re still using our “old” Leapster from several years ago, when my oldest was ready for it. I think my youngest would be ready for the new stuff! Our family loves the Leapfrog products! My 3 boys love leapfrog games! This would be amazing! My kids would love this prize pack. Thank you for an awesome giveaway. Wow, this is an amazing prize! My daughter is just the right age for this and would love it! I would love to win this for my friends son, he’s turning 3 next week! my daughter is four and she would love this !! i bought my son one when he was 4, it was a leap frog that hooked directly up to the tv, and he loved it … im sure this one is way better, the one i got my son was about 3-4 years ago .. I bought the first one that had came out for my oldest and he loved it then it stopped working. I know my little one now would love this pack, he is excited right now. Leap frog is the best. Love all ur products. This looks like a great package! Leap frog has great products for kids to learn! My nephew would love this! My kids are a little too old for this now but my nephew loves to learn! I would love to win this for my nephew! Thank you for the chance! Loved Leapfrog for my own daughters and would love to be able to give this to my sister’s kids. I have 3 kids that would love this stuff!! We are big leapfrog fans!!! What an amazing prize package! My kids have grown up using LeapFrog toys. Thanks for the chance! What a wonderful prize. Some little boy or girl is going to be very happy. I would love to get these to use as a gift. This would be great for my youngest grandchildren. We love the leap frog brand they always have the best durable and excellent quality products 🙂 we’ve never had the leap TV, however I have heard amazing things about it! I would love to have this for my daughter when she gets older. I have herd so many good things about leap frog. I would like to get this for my youngest grand children. What a great prize package. My kids would be so thrilled. Thanks for this chance. This is an awesome giveaway! Great educational learning tools for my grandsons. They would love this! Thank you! Would love to give these to my great nephews!! They are so into things like this! Leapfrog products are the best! My son would be in Heaven!! thank you so much for the chance Great Great prize wow! My grand daughter would love this and I would love to be the one to give it to her!! My nephew would love this. Thanks! Wow! This would be a great Valentines gift for my daughters! We love our 3.5yr loves learning with LeapFrog products! I want win this so I can donate it! I would love to win this for my grandkids because they love to learn new things. I have purchased several Leap Frog products over the years and have never been disappointed by them. My son would totally love love love this! This is a great prize package–thanks! I would love to win this for my grandson. He is fascinated with our iPads, Kindles, and iPhones. I haven’t had a leapfrog in so many years. They are more educational now. They are so much educational then years,ago. I LOVE leapfrog. I would love to win this Leapfrog mega prize for my daughter and son. My daughter is starting school this year and it would be great for her to have one. This would be great for toddler grandkids! We have the LeapTV and love it. I’d love to win one for my niece. I would love to have any of these for my 2 youngest sons. I have always liked Leapfrog products. This would be so exciting to win. This is awesome! The perfect gift for my friends’ little boy! 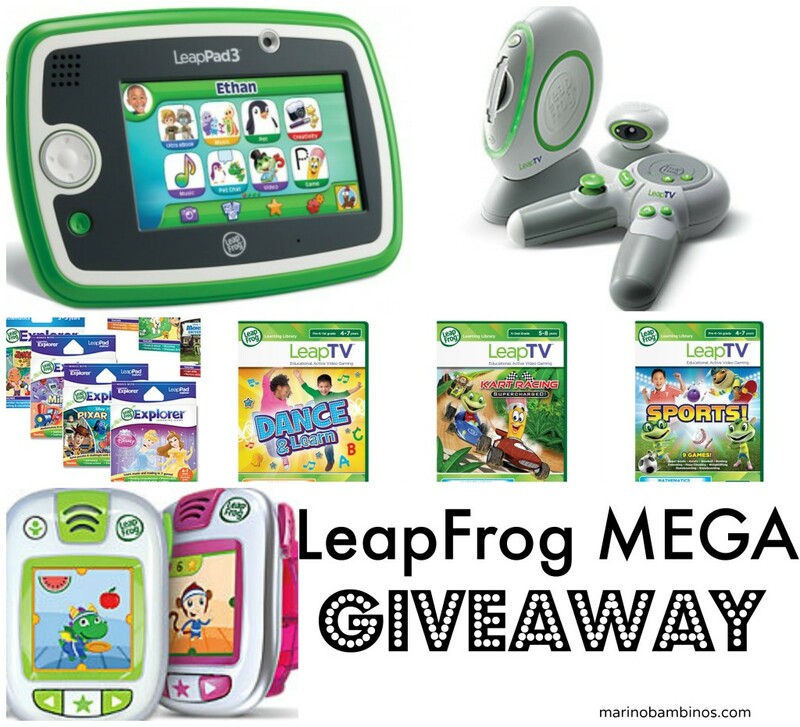 This LeapFrog MEGA Giveaway is a fantastic giveaway! It’s worth $500 and includes one LeapFrog LeapTV and three LeapFrog LeapTV games for it, one LeapFrog LeapPad3 and five LeapFrog LeapPad Games for it and two LeapFrog LeapBands. This will make a great Christmas gift for next year for one child or may be divided up to give to two or more children. They’ll be very happy and we love that it’s a great educational toy! I like the Leapfrog for my grandson. I’ve heard nothing but good things about LeapFrog products. This is a great opportunity! Thank you so much for offering this. There’s something that each of my kids would love! LeapFrog is the way to go! Thanks for the chance. This would be an amazing to win. We are a homeschool family and use a lot of leapfrog products. This looks like great fun for the kids! We didn’t have this fun stuff when I was little! This would be so cool for the grandkids!!! My 3.5 year old would go nuts to find this as a birthday present in April. LeapFrog has such a great reputation. Great giveaway! Would love to win this for my daughter! I have a bunch of nieces and nephews that would love this. Wonderful giveaway and prize. Thank you! This would be great gift for my nephew. Leap Frog products are always wonderful and educational. I’d love to win for my autistic daughter! I think this would be something she could get in to playing with and could do something to interact with her sisters! This would be awesome for my daughter’s 3rd birthday coming up!! I would love to win this for my boys, the cold, snowy weather is keeping them inside more than I’d like! hi, i am one person….do i win? i like these LeapFrog products. I love the Leap Frog products. They are perfect for preschoolers and kindergarteners. my son’s birthday is next month, i would love to give him a gift that would be valuable to him! My kids always enjoy Leapfrog toys. I appreciate that they are educational. Thanks for the chance. I love leapfrog products. My grandchildren are at just the right age for Leap Frog. Leap Frog is a great fun and educational product. Thanks for the chance! leapfrog makes good products. Happy Sunday everyone… and may you have a fantastic week! Leapfrog makes the most amazing and fun products that helps kids learn while they are playing! Wow! What a fantastic opportunity and a wonderful prize package! Thanks! I sure would love to win this for my kids. I love the LeapFrog products! What a great prize! I kind of wish they had these when my kids were young. They’re 21 and 19 now, so a bit past Leapfrog. AMAZING giveaway! Would be so thrilled to win this for my 5 year-old daughter, Chloe! We love Leap Frog at our house. My son would be over the moon if he won this!!! My boys loved their leap pads! The girls would love these too! Leapfrog is great and kids love it. Nice package of fun and games. We have seen the new Leapfrog TV at Toys R Us. We don’t have it but would love to win and try it out. My daughter loves watching the LeapFrog moives on Netflix. My two boys would love anything from Leapfrog! This is awesome, great for the grandkids! we have a 1 year old grandson who is very special to us, we have purchased a few leap frog toys and he loves them, I would love to win this gift to put away for him, thanks for the chance to try. Would love to win for my grandson or niece. We absolutely love LeapFrog products. Such great quality. We love Leap Frog! Thank you! Never owned any of their products but look great! Thanks for the chance. what a great learning tool! My niece loves leapfrog products and I love them too because they can teach her a couple things. Thsi would be amazing to win for my daughter! I think my daughter in kindergarten would love this. It looks fun and educational. I want to give this to my granddaughter, she just had a baby sister and this would be a nice gift so she feels special also. Leapfrog is a great company for kid toys, and this is a best-of prize package. I have looked at the LeapTV and I doubt if this will be as venerable or as quick-selling as some of their other established products. On the positive side it IS a “get up and move it” console so I’m still a fan of LeapTV. My twins would love this. They’ve been wanting a LeapTV! Would love this for my two daughters. Leapfrog products are the best! My children have learned more from these toys than from any other. Would love these for my little girl. This would be a great gift for my grandson. Leapfrog products are a great help at home, and he stuggles a bit at school so this would be a wonderful aid. Thanks for hosting! We love Leapfrog. Such quality stuff and makes education fun!! My grand kids would love it! They are always borrowing my phone to play games or for learning apps. My son would go completely insane if I won this for him! He LOVES leapfrog brand and loves electronic learning so much! Wow this looks so amazing my son would love this and so would I. I would love the educational part and he would still get to play games. Thanks for the chance to win this awesome prize! This would make an amazing gift for my three boys. Thank you! My daughter would love the LeapFrog Leap TV and the Leap Pad . Thanks for the giveaway. This looks like a really nice package! I just love Leap frog…it keeps the kids busy and it’s educational at the same time. I am sure my kids would love this also. Great package would be great for my niece and nephew. Leapfrog is a great learning tool and great for cabin fever also. We would love to have this prize package. Leap frog is the best! I have also been reluctant to allow video games in my house but my two kids ages 5 and 6 have been begging for a video system. I like that Leap Frog has educational but fun interactive games for kids. I would rather that they learn while playing than just mindlessly entranced in a video game. That has been my main reason for not getting one. Now I guess I will be changing my mind. This would be perfect for family time at our home. The kids would love to win a Leapfrog mega prize! I have three young children and LeapFrog has been a wonderful resource for our family. Educational and fun…it doesn’t get much better! My son loves his LeapPad2; He also loves showing his younger sister how to use it. This would be great in my classroom. The kids would love it! My children would love this Thank you for the opportunity. My family Loves LeapFrog products! My two older children grew up using them and now it’s my youngest child’s turn! My grandson would love this, thanks for the chance! I love the Leap Pad system. It brings education and entertainment together for kids. Would love to win this for my 4 year old son! LeapFrog is such a great brand I love them. This is an amazing giveaway! My niece got one of these for Christmas and she loves it. I would love to get one for my son. I would love to win this for my kids – if the snow keeps up like it has been this winter we will be spending LOTS of time indoors! We have A 2 and 4 year old that would Love to try Leap Frog TV because they love all the Leap Frog games and toys they have. What an awesome giveaway. My two youngest grandkids would love to have the Leapfrog package. I love their products as they are educational as well as fun. I would love to win this prize pack for my niece! She would have an amazing time with these Leap Frog products! I have never even heard of this Leap Frog product but I’m sure my kids would love it like they do their other Leap Frog toys. Leap frog makes such great learning tools-especially for kids with disabilities! We are big Leap Frog fans, & would love to try Leap Frog tv! Thanks for an awesome giveaway! I would love to win this to for my son he would love it. This would be a great learning tool for our son . I really like it . I would really like this package for my niece! This would be a great present for my two boys! My four year old daughter would LOVE this pack. An awesome learning kit. I would love to win this Leap Frog Mega Pack for my Grandson! He would love it so much! Thanks for the chance! I’d love to win these for my kids and nieces! I have loved leapfrog for a long time now. Would love to win this!! Thanks for the chance. I would love to win this for my grandkids. The one is 5 now and this would be great for her. The other is only 5 1/2 months but it could be passed down to her as well. This would be great for me and my family! We love their products! We love Leapfrog products! Not only are they fun but they are educational. My whole family is a huge fan of LeapFrog! They make durable, quality products that they stand behind and they have a name that you can trust! I love that they are a company that makes learning fun for kids of all young ages! This would be such a wonderful gift to give my niece and nephew! I would love to win this for my child. My grandkids would love to use these. I like educational gifts for them. My son would love this prize pack! We love our Leap Frog products. Thanks for the giveaway! We love LeapPad, especially Scout the dog. Great giveaway! My son really loves LeapFrog and I would love to win this awesome prize for him! This would be AMAZING!! Thank you!! My children would love this.. My four year old loves to learn, I’ve started her on shapes, time, addition, etc.. it is great to see her love of learning, and how proud of herself she is.. I think she has sparked my two year olds interest in learning with her enthusiasm. Thanks for the opportunity, hope my girls win! This is a awesome leap frog giveaway, everything a kid would want. My grandsons would love it!! I would love to win this because it’s an educational fun interactive product for kids. These are such neat toys and a great way to encourage learning. I would love to have these to help get my daughter ready for school. my daughter kelsey would just love this !!! This is such a great prize pack! Would love to win this so my little one could share it with her little cousin when she’s done with it. Leapfrog products are amazing, I love that they are so educational for kids. This would be perfect for my niece. she is a little delayed and any extra boost would go a long ways. Wow, I would love to win this for my daughter! I would love to win this for my son and daughter who love Leapfrog. I was so excited when the Leap TV came out. I think it would be great for my son. This would make my daughter’s year! My daughter would love this! She has an older leap pad that is getting quite beat up so this would be a great upgrade! This looks so fun! I have a cousin who love this! This would be an amazing prize to win. My niece had an older version of the LeapPad and she carried that thing with her everywhere she went. I know she learned a lot and was entertained a lot with it. So I’m a fan of LeapFrog and I’d love to get these prizes for my own kids. I have not tried out Leap Frog yet for my kids. These would be a fantastic teaching tool. LeapFrog has so many great products for kids! We’ve heard nothing but great things about LeapFrog. I love the whole concept and am especially liking the LeapTV. These would definitely be a way to help with cabin fever! LeapFrog has such wonderful products! My grandchildren would love this. We really like Leap Frog and currently have several of their products. They are great for learning. My daughter would love this. I would love to win this for my granddaughter, Nellie. Such a wonderful learning tool the kids can play for hours of fun. This would be perfect for my youngest grandson. His older brother absolutely loved all of his LeapFrog equipment. We could really use this! Thanks for the chance to win! I love Leap Frog products, they provide such fun ways for kids to learn! My daughter likes the Leap Frog stuff. They are easy for her to use and she has learned quite a bit. My daughter loves her leapfrog products and would love these; she mentions them every time we see them in stores and on tv. So excited to win this pack for my daughter! She would love to have this. It is almost my twins’ birthday, they would love this! inwould love this for grandkids. Thanks so much. My son has a birthday next month and this would make a great gift. I would much rather him play Leapfrog games than whatever is popular right now in the app store. My nephew’s LeapPad doesn’t work anymore, so this would be great! I love Leap Frog Products because they are the best products for children that I have used with my kids and grandkids. I love love Leap Frog and would love to win this prize pack for my grandson and granddaughters. Great giveaway! I would love to own this for my nephew! This is a giveaway so good it’d be hard to keep a secret until little man’s Birthday. 🙂 Thanks for hosting. Huge fan of LeapFrog! They are a great company! My son loves Leapfrog! Great giveaway.